The article “On the relation between task variety, social informal learning, and employability” will soon the published in Vocations & Learning (I’ll update you once it is ready). Fluctuating demands and fast changing job-requirements require organizations to invest in employees so that they are able to take up new tasks. In this respect, fostering employees’ employability is high on the agenda of many organizations. As a prerequisite for creating employability, many scholars have focused on the role of social informal learning. In this study, we extend this perspective and examine the relationships between task variety, social informal learning, and employability. We hypothesized that task variety is a catalyst for social informal learning, which in turn enhances employees’ employability. We contribute empirical evidence for this mechanism. However, while task variety leads to social informal learning and, subsequently, the competences needed for employability, task variety also may have negative direct effects on employability. We discuss the implications of these findings for future research and practice. Froehlich, D. E., Segers, M. S. R., Beausaert, S. A. J., & Kremer, M. (Forthcoming). On the relation between task-variety, social informal learning, and employability. Vocations and Learning. My paper “Work in progress: the progression of competence-based employability” was just published in Career Development International. Purpose: Employability and its components have received a lot of attention from scholars and practitioners. However, little is known about the interrelations between these different components of employability and how employees progress within their employability trajectories. Therefore, a model of such progression was constructed and tested using Van der Heijde and Van der Heijden’s (2006) employability measurement instrument. The paper aims to discuss these issues. Design/methodology/approach: The propositions were tested empirically by applying a Rasch model using a sample of 167 Austrian business consultants. 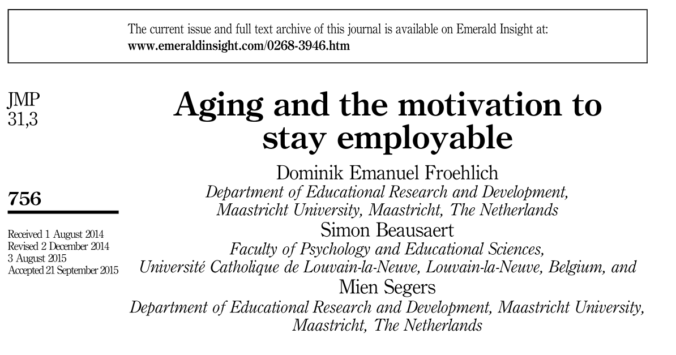 Findings: The findings lend some support for the hypothesized progression model of employability. Specifically, the items measuring occupational expertise are largely located in the group of items that were relatively likely to be endorsed. Also, the items of personal flexibility and anticipation and optimization were, in general, less likely to be endorsed than the items of occupational expertise. Research limitations/implications: The major thrust of this paper is a theoretical one. However, the empirical demonstration tentatively supports the proposed model, which implies that further, more robust longitudinal research in this direction may be a worthwhile endeavor. Practical implications: By understanding which competences are important at which stage or across which stages of an individual’s career, career advisors and human resource management professionals can give more targeted advice concerning career management practices. Originality/value: The present study contributes to the literature by investigating how employees may make progress within their employability trajectories. Froehlich, D. E., Liu, M., & Van der Heijden, B. I. J. M. (2018). Work in Progress: The Progression of Competence-Based Employability. Career Development International, 23(2), 230–244.